If you don’t have access to an infinite render farm, chances are you might be concerned about render times. With a certain amount of flexibility and exposed controls you may be tempted to try lots of different things or even combine techniques seen on the internet. In some cases this can be useful and in others this combination doesn’t work well. If you use an inexpensive Final Gather solution you may increase the quality of, or add, Ambient Occlusion to increase details. If you then find that Final Gathering has splotches or hotspots caused by some other effect, your first instinct may be to increase the quality of Final Gather. 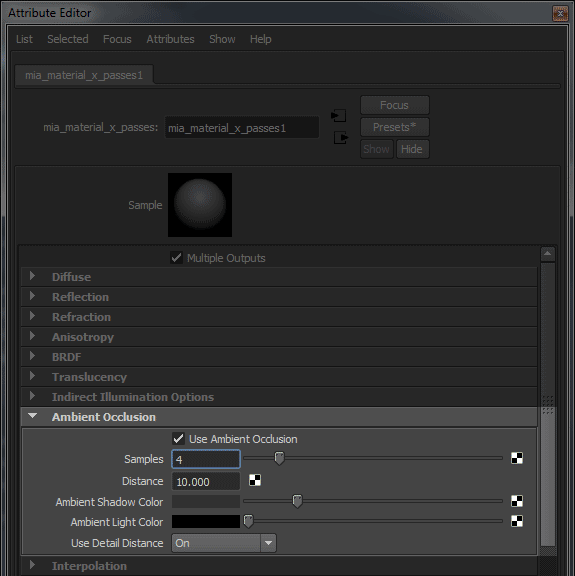 Well, it may be that now you can reduce or eliminate the Ambient Occlusion. In some cases we forget to do that and suddenly our render takes much longer. This is both the benefit and downfall of flexibility: keeping track of your decisions. Where’s a good place to see what might be eating your render time? The Output Window and the Time Diagnostic Buffer with Unified Sampling. What effects cost you the most time? Well, that depends on what you are rendering. Hair can be difficult. Or scenes that reach your memory limit. Layering shader on shader can also increase or double some ray counts (this will change with the introduction of the layering library in mental ray 3.11) Even texture input/output (I/O) can make rendering slower. I will try and touch on some of the more common cases and solutions. I usually choose “Progress Messages”. The option below that is “Detailed Messages” and gives you more information, but also tells you every time mental ray blinks and isn’t usually necessary. 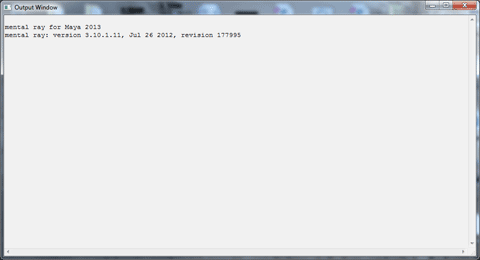 Also, the more messages it prints, the more it might impact render time as a debug process. So, I have rendered a decently complex scene from a project at 1280 by 720. I have quite a few lights in the scene, most of which are area lights (about 46 of them, most are small). I have wide glossiness and I am using the Native IBL to render the environment lighting. What can you gain from this? In a raytracer, you are shooting quite a few rays around in your scene. These strike other objects and more rays are sent, etc. This can grow geometrically in a scene where you are using some expensive effects. 3. Scenes with high detail or contrast will need more to improve anti-aliasing. Tuning: Reducing these is only an option if you can live with less quality (more grain or aliasing). Reducing these in Unified Sampling is done through decreasing the Quality parameter or by artificially capping the maximum through Max Samples. You can try using a Render Region on a noisy area of the most complex/blurry frame. -Gradually lower the Quality until you reach a limit of what you’d accept. -Lastly, alter per-object samples as needed for difficult objects. These are rays cast into a scene from an object/shader to collect indirect reflection (light from other objects seen as a reflection). When these strike another object they run that object’s shader to get color information. 2. You may have quite a few if you have a high trace depth set by either the shader or render settings to allow more than one ‘bounce’ of the ray. This is necessary for things like a reflection in a reflection (imagine a hall of mirrors). -reduce the samples for glossy rays based on acceptable quality (the appearance of grain) For objects and scenes where this is textured or there is motion blur and/or depth of field, we recommend a brute force approach (Using Unified Sampling) with a setting of ‘1’ sample. You may need more for very wide glossy lobes on perfect surfaces without textures that are very reflective or blurred. 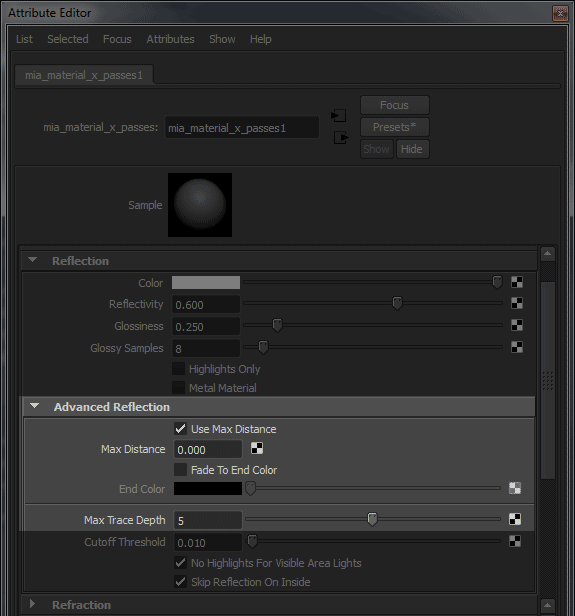 -reduce the trace depth where it makes little or no visual difference (you may not need a reflection of a reflection of a reflection if it is blurry or dim) Or use a falloff distance with either a color or environment attached. These are rays sent through and bent or change direction (refracted) through objects like glass or windows. Note that this isn’t the same as transparency where a ray passes through an object and is not bent. Transparency is handled differently in a scene but may still be expensive with large amounts of semi-transparent objects. There are no such rays in this scene or they would be listed. Glossy refraction (specular transmission) is an effect like frosted glass and can be one of the most expensive effects. 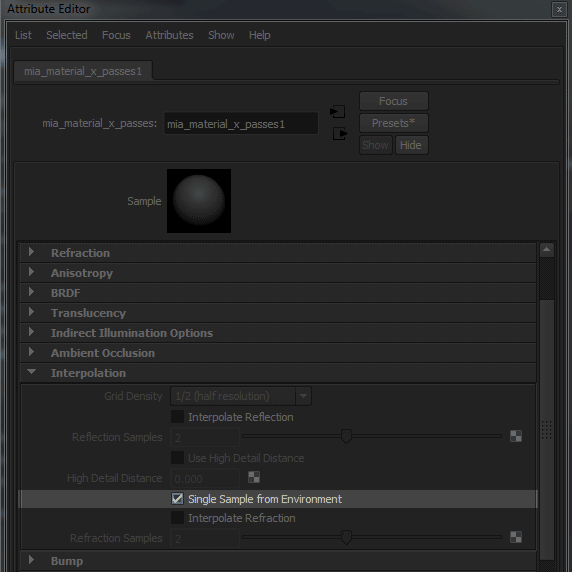 It is not as simple as a more diffuse effect like specular (glossy) reflection. 1. Frosted glass or blurry effects will increase these. 2. A high refraction trace depth may also increase these. -Reduce the samples on the refraction (similar to the control seen in the mia_material reflection samples) to an acceptable amount of grain. 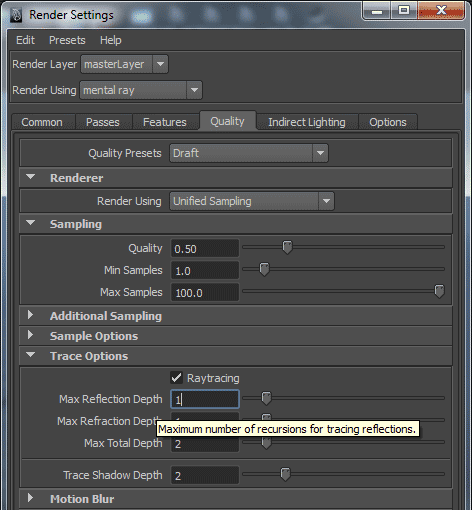 -Reduce the refraction trace depth in the shader or the Render Settings. Or use a falloff distance with either a color or environment attached. A good guide for the global trace depth is how many surfaces you must pass through before stopping. For instance: a correctly modeled (volumetric) empty bottle will have 4 surfaces to strike before passing through the other side. Shadow rays are rays sent from surfaces back to light sources. These may sample an area light (direct reflection or specular for invisible sources). These can be expensive and are usually the most prolific in a scene. The more lights casting shadows and especially soft shadows, the more you will have. The larger the area light, the more you will have as well if you need to reduce grain. And naturally, the more lights you have casting shadows, the more of these rays you will have. 1. Large area lights may be sampled more to reduce shadow grain or direct reflection noise on shiny objects. This happens when the light is invisible or the shader is selected to use “highlight only” for reflections even if the area light is visible. 4. High ‘Quality” settings on Native IBL or high samples on the user_ibl shader. A quick way to read about optimizing area lights can be seen in the Area Lights 101 post. -Reduce the trace depth as needed. You may not need the reflection or refraction of a shadow in a blurry surface; especially if Final Gather is already darkening it. -Old trick: use a depth map shadow or preferably a Detail Shadowmap that can be baked and reused on many frames assuming the objects or lights casting those shadows do not move or are not animated. You can do this selectively per light. 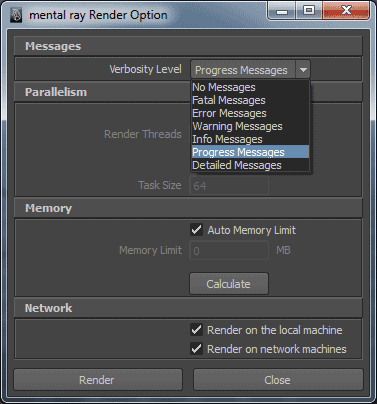 Environment rays are rays that leave the scene and call the environment. These are usually fast. They exist in this scene more often because I am also using the mia_envblur to speed up the environment lookups for glossy reflections as described above in Zap’s blog. These rays are usually the result of Ambient Occlusion rays being sent into the scene. (Ambient Occlusion + Colorbleed isn’t the same thing in this case.) These are caused by their inclusion in a material like the mia_material or in a separate occlusion framebuffer pass. In the mia_material with Unified Sampling we usually recommend keeping the sample counts to 4-6 since it is like a lighting effect. If used in a pass there are a few things that affect the quality: these things may be the distance they travel, the distribution of objects in the scene, and of course sample count for the buffer. (Note: The Native IBL set to “approximate” mode will generate probe rays as it is using lighting by the environment through occlusion. Not usually recommended but ok for tests.) If no distance cutoff is used, it increases the raytracing overhead for your scene by striking anything contained. Ambient Occlusion has become a staple effect for most CG work but the need is less than before. Generally used as a fake for global illumination in the past, the inclusion now that global illumination is faster and more detailed isn’t always necessary unless the global illumination solution is purposefully reduced or interpolated a lot and loses details. Creating an AO pass by default for compositing can be used to enhance or create details that aren’t there (occlusion where there is direct lighting is not realistic but is an artistic consideration) Using this pass as a multiplication in post is also incorrect mathematically if trying to reproduce a beauty render. 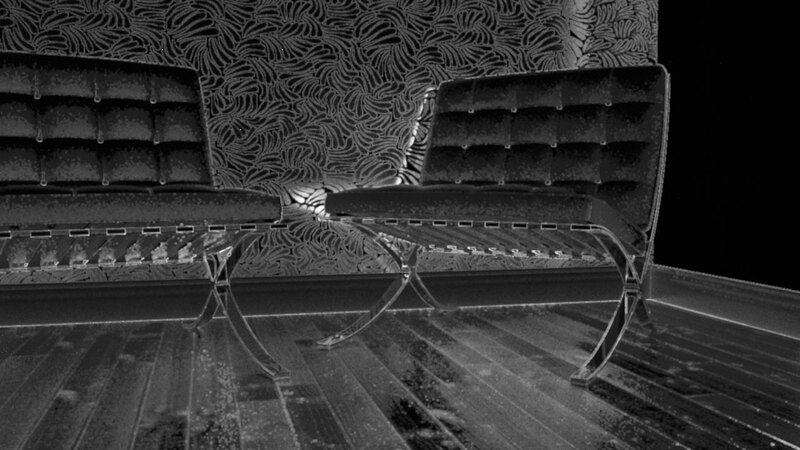 Production is starting to move away from using Ambient Occlusion as a pass or effect in modern raytracers. Path tracers like iRay automatically include such an effect in its light transport so adding this effect on top is redundant. 1. Avoid large sample counts in a shader. These rays may be sent when the shader is struck by some other ray like reflection or refraction. High trace depths will call more and more of these as the ray bounces around. 2. Use a small distance to avoid lots of strikes on other objects that are unnecessary. For example: Buildings to scale 3 city blocks apart do not need to occlude one another. 3. Detailed indirect illumination may decrease the need to have this feature on at all. Final Gather prepass time is greatly influenced by “Accuracy” which are the number of rays sent to measure the scene and “Point Density” used to place points projected by the camera on geometry. During the render phase, “Point Interpolation” can increase render time at higher settings because the renderer is doing more work mathematically. Since we are talking about the render phase and not the prepass phase I will just mention those solutions here. Final Gather settings and prepass may be covered later. This may sound silly, but most modern raytracers do not have a Scanline option. This is because we have reached a point where complex scenes with lots of triangles are common. Scanline rendering may slow down this process with many triangles. Instead you should turn off Scanline and select “Raytracing” as the renderer. This is the default in Maya 2013. Rasterization also counts as a Scanline algorithm although more modern. This is often why comparisons with other renderers may show a slower result, users with lots of objects or displacements fail to turn off Scanline. 2. Un-mipmapped or un-cached textures, this will force mental ray to load the entire full-resolution texture from the source even if all of it is not seen. 4. Poorly filtered textures may also call more eye rays to solve aliasing. This runs the shader and may increase all of the other rays counts. *The cached memory limit with the registry option to force more efficient handling, either an increase or decrease. This and the option above work together and are scene dependent. Not always worth a lot of tweaking unless your scene is exceptionally texture heavy. I can now render scenes with hundreds of 4k textures with only 8GB of RAM locally. I didn’t cover interpolated reflections or refractions. This is because in animation they are difficult to not artifact. With the usage of Unified Sampling you may not even need those features. Future shading models (BSDF) will also omit these features. Try to avoid layering shaders for some effects. A lot can be accomplished through selective layering of textures instead. 3.11 will introduce the layering library that will help remove this effect of added ray counts. Using ray cutoff values: these can be useful and exist in the mia_materials as a way to tell the shader not to cast a ray if the effect is not important. It’s a little tricky to use, but heavily traced scenes may have some speed-up if this parameter is increased. Do so slowly and test frames, it will erode raytraced effects if too high with little benefit. Use the Time Buffer Diagnostics as seen in the Unified Sampling for the Artist post to identify where your scene is taking longest to render. 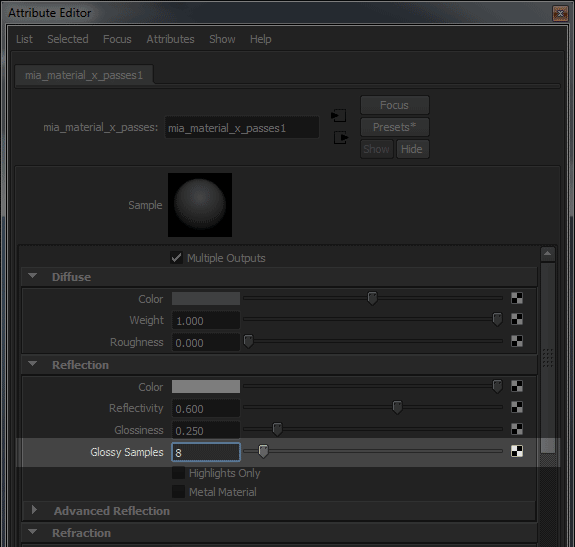 Then look at those shader settings or possibly change per-object sample settings. Time per pixel measured in ‘S’ or seconds. Brighter is longer. The decadent “Maya Glow Buffer” is very slow on large resolution rendered frames, even if the effect isn’t used. 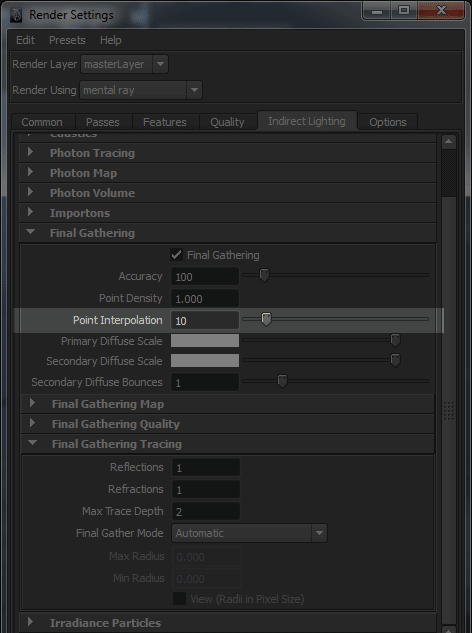 Turn off “Export Post Effects” in the Render Settings > Options and do the effect in post. Scenes rendered in motion with motion blur do not need to be perfectly smooth when viewed in motion. Do not marry an image. Some tweaks may alter the look. Even client notes alter the look. Go with the best balance of what’s achievable and is possible in the time you have. Otherwise you’ll constantly be unhappy. To resolve artifacts, simply “cranking up the settings” is a horrible idea. Use the progress messages and the time buffer to make faster/smart decisions. Form habits of rendering with correctly prepared textures and default settings. Only tweaking where necessary by recognizing the cause of the artifact, be it FG splotch or aliasing crawl. Begin to ween off of using Ambient Occlusion as a default effect or pass. The original reason to use it (ao multiplied against an ambient pass) no longer exists and is really an artistic consideration now. I did not include Irradiance Particles or Photons. These aren’t used as often (or at all) in VFX or animation work. They are also (like Final Gathering) topics in their own right. If non-of-the-above applies, change your BSP2 to BSP and try again. If your geometry has bad bounding boxes and other problems, ray traversal can be painfully slow. This is a geo problem, remake it if necessary.